From Brave Giant comes the next installment of the best-selling Demon Hunter series! There have been no signs of demonic activity since Ragnar’s defeat five years ago. Now you’ve been called in to help Officer Arthur Brown with his newest case. A woman’s been murdered, and her daughter’s missing. Is this your typical murder case, or is there something more sinister to blame? Follow in the path of the supernatural to find the killer and uncover your own origins in this spine-chilling adventure! Find three different types of collectibles! Enjoy the soundtrack and wallpapers! Play as Officer Brown to uncover traces of demonic forces in the bonus chapter! 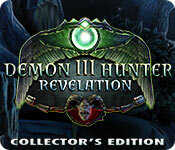 Demon Hunter 3: Revelation Collector's Edition is rated 4.0 out of 5 by 25. Rated 5 out of 5 by crusades from fantastic game a brilliant game with wonderful creepy graphics, great varied puzzles and HOPS with many things to do and most of all, at long last, very good believable voices with some gravitas to them instead of laughably bad ones. Music suitably eery and I love the way every time you collect something in the HOP the voices answer. I also like the fact that not everyone is a hero in this game - there is a cowardly gardener (I think) lurking around but then maybe he is a baddie. Still to find out... Good things to collect and storybook details too. Am still in the demo but a definite buy for me. Rated 5 out of 5 by graceland9 from Demons and Murder When a daughter disappears, it's your job to come in and help the police find her. Expect dark scenes and amazing interactive puzzles along with some of the most intriguing HOS I've ever seen. Demon Hunter 3 was a great game to play because of graphics (dark and scary but still gorgeous) and amazing backstory. This is the first I've played in the series, and I'll certainly be back for more. I really like creative puzzles, including one set-up where you brew almond oil. Add this to what happens to the priest (seriously creepy) and a strong detective, and it all combines to make a winning game. Rated 5 out of 5 by cuorips from A really solid game ! I cannot say enough about this game. Creepy with great music, NO enchanted overdrawing from the 18 th century ! What a relief ! Lots of nasty demons, great graphics, tons of new HO's and puzzles ( a bit easy ) but fun, room after room after room of things to do...Great map, great art, and again a very haunting music and nasty feeling !! I will play it again until I find all the hidden objects and morphing Ho's ! This was fun and half price, can't go wrong with that one ! Rated 5 out of 5 by pennmom36 from ************* DEMONS BEGONE************ Dawn is on her own now, the last Demon Hunter standing! It's been over 20 years since the Archdemon Ragner killed her father, and now the man who raised her, Professor Ashmore is gone as well. Even the Amulet that protected her is gone, shattered to bits and pieces! There's no time for grief however, Dawn's good friend and demonic believer, Sheriff Artur Brown (did someone misspell Arthur?) has asked for help in solving the murder of Olivia Martin. Olivia's only child, Lila is nowhere to be found, and this case has all the signs of supernatural and demonic activity surrounding it. Evil does exist, and as long as there are demons to torment humans, the Demon Hunters will risk their lives to protect mankind. I've always been a fan of this series, and I'm so glad BF has finally offered this game as a Collector's Edition. Chronicles From Beyond was a really good game, but the graphics were less than desirable, A New Chapter came along with a very intriguing storyline and much improved graphics, Revelation however has got it all, beautiful computer generated graphics, creative puzzles and a super exciting plot, simply perfect. There are complex inventory items to fidget with, Achievements to earn and 45 Hidden Collectibles in three different categories, Coins, Dolls (creepy dolls) and Scrolls which are basically Family Tree portraits with bios. 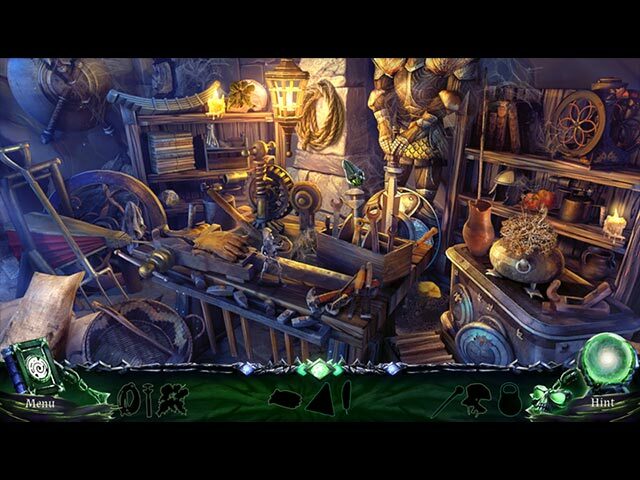 The Hidden Object Scenes are very well done but nothing to write home about, there are Interactive List Finds and Silhouetted Shape Finds, Symbols to Find in a storybook, some of which leave behind or expose fragments or keys needed to find the final object. Some of the scenes have Morphing Objects that must be in their correct form to click on. There is an optional Match Pair Game where you flip over two tokens at a time and try to find matching pairs of images. The Mini Games however are top notch, but then again, this entire series has always offered creative puzzles. The following are brief descriptions of some of the Mini Games you'll encounter during the demo: 1) Turn all crystals green by rotating them left or right, left turns crystals 2 fields left, right turns crystals 3 fields right. 2) Find symbols shown by interacting with a storybook. 3) Discover the order in which the symbols hanging from chains on each door should be pressed by uncovering clues in the correct order. 4) Rotate cylinder sections to complete the image. 5) Place and rotate the gears on to the designated surface in a correct order so that each of them rotate. This Collector's Edition has replayable Mini Games and Hidden Object Puzzles, 5 Music Soundtracks, 24 Concept Art Pictures, 6 Wallpapers, 15 Hidden Coins, 15 Hidden Dolls, 15 Hidden Scrolls, 8 Achievements available in Gold, Silver and Bronze, a built in Strategy Guide and a Bonus Chapter, enjoy! Rated 5 out of 5 by biscuitsmama from REVELATION IS A CREEPY GAME SURE TO CREATE A FEW JUMP SCARE MOMENTS After defeating the arch demon Ragnar, you have been called in to investigate a crime that seems to have demon written all over it. 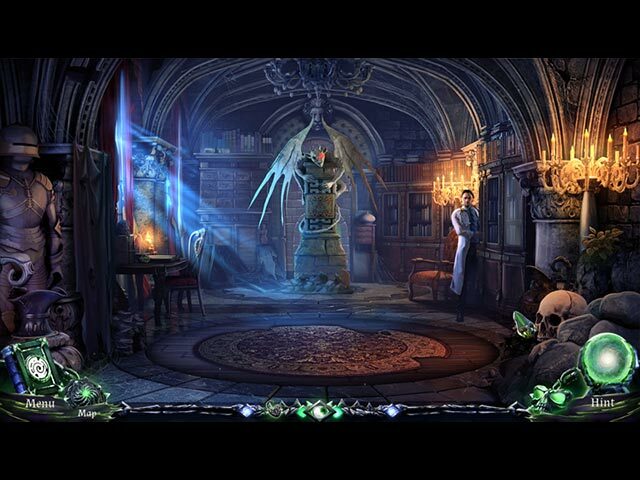 In Demon Hunter 3: Revelation, you are investigating the murder of a local woman whose daughter is now missing. Your old friend detective Brown has asked for your help, so you agree to take a look and see what you can find. Sure enough you do find things that indicate this is indeed a supernatural case. When I played the beta for the game the graphics were quite mediocre at best and I was quite happy to see that the dev has polished them up a bit before releasing the game. The graphics are now much crisper and I’m happy they managed to keep the eeriness that gives the game a great spooky feel. The game does offer four modes of gameplay that include the custom mode. If you select the custom mode the hints recharge in a range of 5 to 90 seconds and mini-game skips in a range of 5 to 120 seconds and you can also get rid of that dreaded misclick penalty. You have an interactive transporter type map that is present when you begin the game. I suspect at some point there will be another tool but it is not present during the game demo. The HOPS present a variety of styles most of them familiar but I like the way the developer has set them up to offer a bit of a change from what we normally find. That feature alone makes the game worth playing. Unfortunately, I found some of the items difficult to locate in the scenes, and that is particularly true in those where we must find items according to silhouettes. The mini-games are awesome and without a doubt one of the best parts of this game. Some of the minis are very challenging so I did skip them during the demo but can’t wait to get into the full game and take my time while I enjoy solving them. The CE version of the game has three different types of collectibles that include dolls, coins, and portraits. There are morphing objects found in some HOPS and achievements as well. I like that we can replay the HOPS and mini-games because in a game where the minis are quite excellent this is a huge CE benefit. Other items include the standards that we find in most CE games such as a bonus chapter, strategy guide, music, wallpapers, artwork, and screensavers. Demon Hunter Revelation is an awesome game and although we are dealing with another demon, a storyline that is becoming a bit too over-done, I still love this game and everything it has to offer particularly the HOPS and mini-games. The development team has done a terrific job of putting together a game that is sure to please those of us who enjoy spooky games. Even though I love this game, please try the demo to see if it is a game you will enjoy. Rated 5 out of 5 by skullfun from Time to face the Demons Detective and Ragnar will stop at NOTHING!! I absolutely love this series. From the beginning where Professor Ashmore raises you as his own child to help you discover your supernatural past in Chronicles from beyond. Then 20 years later you deal with the ultimate challenge of facing Ragnar, the most powerful demon of the underworld in Next Chapter. Now five years have passed since you defeated Ragnar but demons are still here. Your friend Officer Brown invited you to the crime scene, where Olivia Martin has been murdered. Officer Brown believes it was work of the demon. Moreover, Olivia’s daughter Fiona has gone missing since that fateful night! Get help from the gravedigger concerning specifics facts about the case. Meet the Priest Father Jones, he is in the Greenhouse but it won't be easy getting in. When you witness Father Jones being abducted by demons you know you need to get to him quickly but soon you discover his terrible fate; bleeding from the eyes and dead. Now you realize that demonic forces are the reason for these atrocities! Use your talents and your wits to follow tracks of the kidnapper and find out, why does he need little Fiona, what purpose?? Find out who killed Olivia Martin and took her daughter Fiona in this beautiful and gothic Hidden Object Puzzle Adventure. It's a phenomenal adventure with Unique hand illustrated art/graphics which look very 3D. The voice overs are stunning....if you look into the character's eyes you don't have to read the text. Text is in small print at the top of your screen this time. 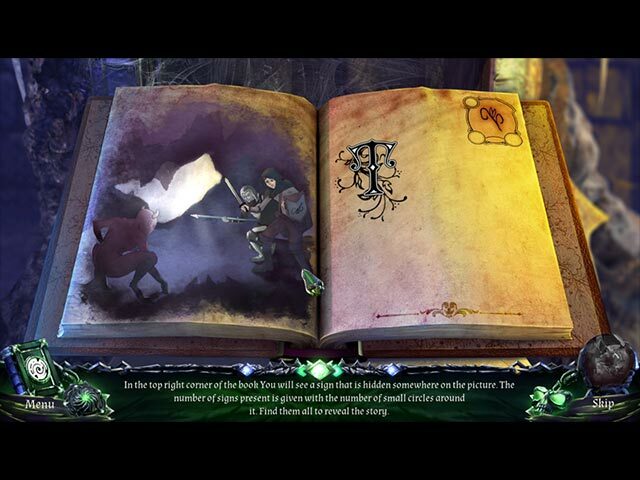 This Gripping Gothic Game is everything I expect from this genre and more. There are some mystic sublevels in Demon Hunter III: Revelation Collector’s Edition, where you'll search for more than enough tributes. Demon Hunter 3: Revelation is full of emotional encumbrances and delightful trophies as well as loads of additional enigmatical whereabouts. I know Fans of the series are going to love this for their collection. If you are new to the series....this is an excellent place to start. Players of all Levels can enjoy this Supernatural Thriller!!! What a great week for the Mariaglorium design Team. BRAVO! The Collector's Edition includes the following Bling: Get all achievements, such as Jack of all Trades and Matchmaker! Gather dozens of collectible coins! Find all collectible dolls through the game! Restore Olivia Martin’s family tree, started by Arthur Brown! A Great Bonus Adventure!